The new course, 6194 meters in length and with large greens designed by Miguel Ángel Jiménez is considered a long par 72 course. It has two distinct parts: the front nine is of typical English “parkland” design without water that extends through gentle hills and level fairways that is easy to walk on a hot summer’s day. 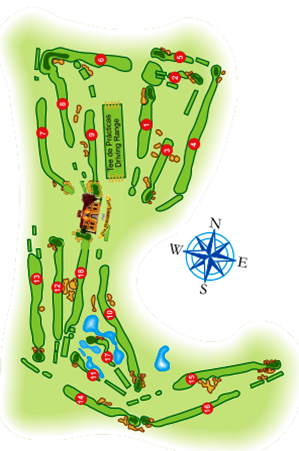 The fairways blend with the surroundings with only two uphill slopes, the 1st hole and 5th hole. The challenge of the front nine are the various out-of-bounds and the fast, large greens. On the back nine the land has been sculptured to create raised greens and diversify the fairways. Water comes into play on the 10th, 11th, 14th, 16th and 17th holes and the large greens with some borrows difficult to read add to the difficulty of the second nine holes. The whole course has a great variety of trees, both native and some newly introduced, and several lakes. One our feature holes is the 6th, a 354m. par 4, easy to reach in two but has a raised green with pronounced borrows. 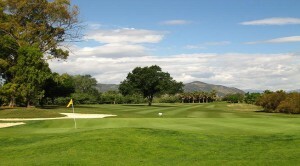 Suitable for major tournaments, Guadalhorce Golf Club is a long course which can be enjoyed by golfers of all levels.